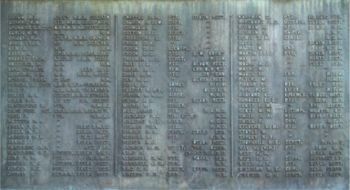 The 1914 - 1918 names are arranged in three columns on a bronze plaque which, in the picture on the left, lies behind the RAF Roundel. 148228 Leading Seaman Alfred Samuel Baron of the Royal Navy, HMS Goliath. Son of Alfred and Caroline Baron of Oreston, Plymouth; husband of Rhoda Baron of 5, The Coastguard Station, Dawlish. Born in Plymouth 9 July 1873. Died 13 May 1915 aged 40. The Reverend Guy Arnott Browning MA, Royal Naval Chaplain and Instructor, HMS Indefatigable. Son of Captain George Browning and his wife Mary Browning of Dawlish. Born in Wimbledon, Surrey, in 1877. Died 31 May 1916 aged 39 in the Battle of Jutland. 222300 Petty officer William John Criddle of the Royal Navy, HMS Amphion. Son of Frank and Charlotte Criddle; husband of Rose E. Criddle of 65 Manor Row, Dawlish. Born in Dawlish 2 April 1887. Died 6 August 1914 aged 27. 162870 Able Seaman Thomas Davis of the Royal Navy, HMS Vivid. Husband of Frances Lily Davis of 5 Swan Court, Dawlish. Born in Dawlish 8 April 1876. Died 19 April 1916 aged 40. Buried in Dawlish Cemetery. K22746 Stoker 1st Class Alfred Thomas Dew of the Royal Navy HMS Indefatigable. Son of the late John and Louisa Dew of Queens's Terrace, Dawlish. Born in Exeter in the March Quarter of 1890. Died 31 May 1916 aged 26 in the Battle of Jutland. Lt. Commander Thomas Hallett of the Royal Navy,HMS Zaria. HMS Zaria was sometimes described as an Armed Merchant Cruiser, although in fact it was a depot ship of 3500 tons, based at Longhope, Orkney from 25 February 1915. Zaria remained at Scapa Flow as an Auxiliary Patrol Depot Ship or Repair Ship until the crew were paid off early in 1919. No details are known as to the cause of Thomas Hallett's death. 224640 Able Seaman William John Hutchings of the Royal Navy, HMS Broke. Parents not known. Husband of Lilian (née Ford) of 11 Commercial Rd,. Dawlish. Born nr. Exeter 1 April 1886. Died 31 May 1916 aged 29 in the Battle of Jutland. 206229 Petty officer Charles Lake of the Royal Navy., HM Submarine E16. Son of James and Ann Lake, of Crediton, ; husband of Mary Ann Lake, of 8, King St., Dawlish. Born 25 April 1884. Died 22 August 1916 aged. The wreck of E16 was discovered in Heligoland in 42 Metres of water in 2001. 197474 Able Seaman Frederick S Luscombe of the Royal Navy. HMS Magic. HMS Magic was ordered as a destroyer under the name of HMS Marigold but was renamed HMS Magic before the launch in 1915. Son of Henry and Mary Ann Luscombe; husband of Beatrice Luscombe of 2 Clifton Place, Dawlish. Born in Highweek 11 May 1880. Died 10 April 1918 aged 38. On 10 April 1918 while she was off Ireland there was an explosion aboard which caused casualties. It was believed it was caused when she struck a mine. 175632 Chief Armourer Frank Morrish of the Royal Navy, HMS Defence (formerly served on HMS Duke of Edinburgh). Son of Ann Morrish of dawlish and the late William Morrish; husband of Emma Louisa Morrish of 11 Commercial Road, Teignmouth.Born in Dawlish 15 September 1871. Died 31 May 1916 in the Battle of Jutland aged 45. Held Long Service and Good Conduct medals. 345096 Ship's Chief Cook George John Pessell of the Royal Navy, HMS Duke of Edinburgh. Son of Walter and Mary Pessell formerly of Warren Road, Dawlish; husband of Prudence Warren (formerly Pessell) of Durnford Street, Plymouth. Born in Dawlish 3 October 1878. Died 16 April 1915 aged 36. 236053 Able seaman George Pike of the Royal Navy, HMS Thunderer. Husband of Rose Mary Pike of 38 Brook Street, Dawlish. Born in Dawlish 10 June 1890. Died 19 February 1917 aged 26. Buried in Dawlish Cemetery. J/10925 Officer's Steward 1st Class Andrew Alexander Selley of the Royal Navy, HMS Vivid. Son of Henry and Bertha Selley of Week, Dawlish. Born in Exeter 8 March 1892. Died 4 April 1918 aged 26. Leading Stoker on SS Belgic. The Belgic (also known as Belgenland) sailed under the White Star Line flag from 1917 to 1923. Because of the large number of passengers she could carry, she was used as a troop ship. PLY/1971/S Private William Blatchford of the 2nd Royal Marine Battalion. 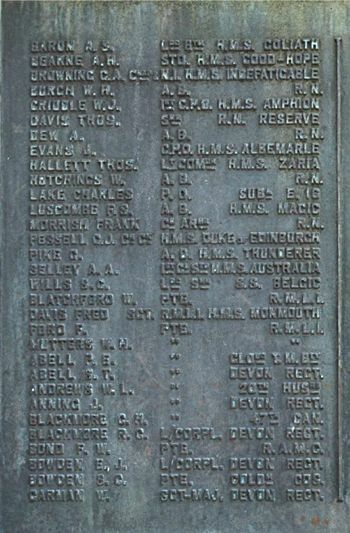 Enlisted 12 February 1917. Son of John Blatchford , formerly of Hensford Farm, Dawlish. and the late Ann Blatchford. Born in Ipplepen in 26 May 1891. Reported missing, presumed dead on 26 October 1917 aged 26. 8823 Sergeant Frederick Albert Davis of the Royal Marine Light Infantry. Son of John and Mary Davis late of Regent Street, Dawlish. Born in Dawlish in the June Quarter of 1883. Died in the Battle of Coronel 1 November 1914 aged 31. PLY/16287 Private Frederick George Ford of Plymouth Battalion, the Royal Naval Division, the Royal Marine Light Infantry. Enlisted 21 July 1913. Grandson of John and Mary Ford of Strand Hill, Dawlish. Born in Dawlish 26 May 1896. Died 9 May 1915 aged 19. PLY16964 Private William Henry Mutters of the Royal Marine Light Infantry, HMS Queen Mary. Son of James and Jane Mutters of 42 The Strand, Teignmouth. Born in Dawlish in the September Quarter of 1868. Died 31 May 1916 aged 47. 24766 Private Sidney Thomas Abell of the 3rd Battalion, the Devonshire Regiment. Son of Thomas and Mary Ann Abell of the Strand Hill Dairy, Dawlish; brother of Percy (see above). Born in Winkleigh in the September Quarter of 1890. Died 1 February 1919 aged 29. Buried in Dawlish Cemetery. 2643 Private Walter Andrews of the 20th Hussars. Son of the late William and Maria Andrews formerly of Princes Street, Dawlish. Born in Dawlish in 1889. Died 23 March 1918 aged 29. 10762 Private John Gwyne K. A. Anning of the Devonshire regiment, the 8th (service) Battalion. 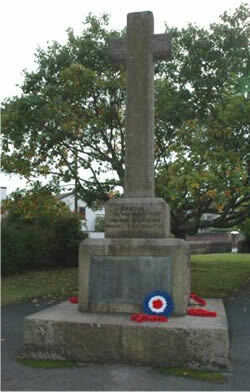 Son of John and Elizabeth Anning of the Marine Parade, Dawlish. Born in Dawlish in the September Quarter of 1893. Died 25 September 1915 aged 22. 827055 Charles Henry Blackmore of the 47th Battalion (Quebec Regiment), the Canadian Infantry. Son of Andrew and Kate Blackmore of Dawlish. Born iin Dawlish 22 July 1890. Died 29 August 1917 aged 27. 240413 Lance Corporal Reginald Charles Blackmore of the Devonshire regiment, the 5th (Prince of Wales) Battalion (Territorials. Son of Walter and Emma Blackmore of Frederick Terrace, Dawlish. Born in Dawlish in the December Quarter of 1890. Died 22 September 1917 aged 27. 1275 Private Frederick William Bond of the 24th (1st Wessex) Field Ambulance, the Royal Army Medical Corps (Territorials). Son of William and Bessy Bond, of 7, Old Town St., Dawlish. Born in Devonport in 1895. Died 23 May 1915 aged 20. 8687 Lance Corporal Ernest John Bowden of the 2nd Battalion, the Devonshire regiment. Son of James and Elizabeth Bowden of the High Street, Dawlish; brother of Sidney (see below) Born in Kenton in 1893. Died 1 July 1916 aged 23. 9438 Guardsman Sidney Charles Bowden of the 5th Reserve Battalion, the Coldstream Guards. Son of James and Elizabeth Bowden of Brook Street, Dawlish; brother of Ernest (see above) . Born in Mamhead in 1897. Died 19 January 1919 aged 22. Buried in Dawlish Cemetery. 240083 Company Sergeant Major Wilfred Carman of the 5th (Prince of Wales) Battalion, the Devonshire regiment. Son of Robert and Harriet Carman. Born in Chudleigh in the March Quarter of 1890. Died 20 June 1918 aged 28.